Who Thinks Japan's Owl Cafes Are a Hoot? Forget cat cafes. Or black cat cafes. Or penguin bars. Japan's latest novelty cafe is the "fukurou cafe" (フクロウカフェ), or the "owl cafe." Owl cafes like Fukurou no Mise ("Owl Shop") and Tori no Iru Cafe ("The Cafe with Birds") started getting noticed online in Japan late last year. 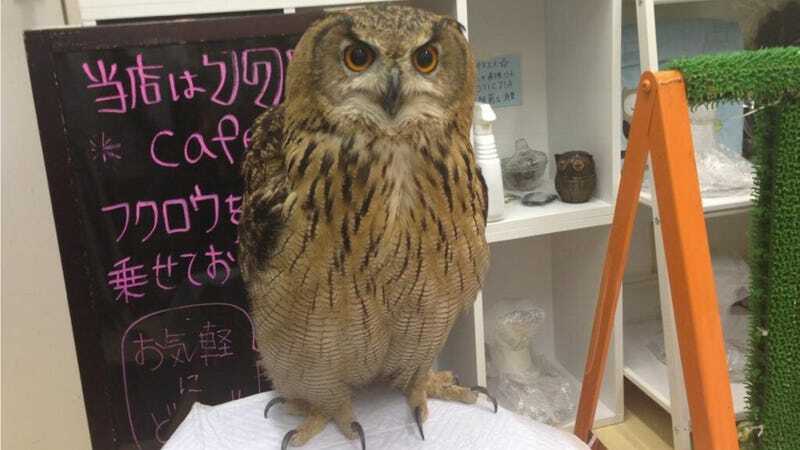 This summer saw more owl cafes open, and currently there are owl cafes like Fukurou Sabou ("Owl Teahouse") in Tokyo, Owl Family in Osaka, and Crew, another owl cafe in Osaka, among others. The owl cafes vary. Some of the cafes even serve owl-themed snacks. Some of them allow you to hold the birds while you drink coffee, while others have much stricter rules about handling then animals. But before you think owl cafes are the greatest thing ever, here's what one U.K. owl sanctuary has to say about keeping the animals as pets: "Our basic advice to those who may be considering keeping an owl as a pet is—DON’T." The sanctuary added that they're noisy, smelly, and warned that, yes, they can be dangerous. So, maybe don't bring little kids to these cafes? Then, there's the fact that these are nocturnal animals, awake during the day for the customers... Maybe, they're on a different sleeping rhythm, but still, I wouldn't want someone screwing up my sleep schedule.